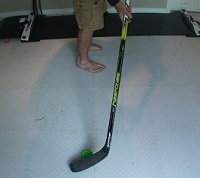 Last summer I showed you how to toe drag and this summer I am going to show the backhand toe drag. The toe drag is a great move to use and very deceptive, if you can perfect the toe drag you will be able pull a few really nice dangles and have the guys on your bench cheering. A lot of people know about toe drag, but not as many people know about the backhand toe drag. What is the backhand toe drag? Basically the backhand toe drag is when you use the back of your blade to pull / drag the puck in close to your feet so you can get past the defenders. This is an effective move to practice because by quickly moving the puck in close to your body you will be able to protect the puck and get it out of the reach of other players. There are actually a few different variations to the backhand toe drag so I have broken each version down in my video. In the video I show you how to practice off the ice, but once I start the deke of the week up again I will show you an on ice version. This one is done on your backhand side and is the most like the forehand toe drag. What you want to do here is roll the blade right over and actually use the back of the toe of the blade to pull the puck in. 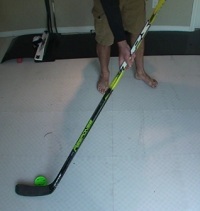 This one is pretty tricky to master but I can certainly see it coming in handy, and is helpful to practice for total puck control around your entire body. In this video I show you all the versions of the backhand toe drag that I have used on the ice. Yeah a lot more people will play the body rather than the puck, when you reach a higher level of hockey. That is when making passes, fakes and speed come into play. For me being a fast hockey player for my size, I can use my body and speed as an advantage. But passing is a good way to deceive your opponent, by having quick and strong passes, it is hard to follow the puck. i was just wondering, i stickhandle a lot and know how to do a toe drag very well compared to others. However i have noticed recently in my ball hockey games this summer that my dekes don’t work, and it doesn’t matter how many toe drags or fast stickhandling moves i do because now that i’m in a men’s league compared to youth last year, i’ve noticed that none of the players focus on the ball, they always target the player, in your video you would say how you leave the puck there and they would come for it but usually they just go for me and forget about the ball till they’ve tied me up. Can you fix deking around this or is the only solution to pass because this is usually when i’m trying to get through a defender for the breakaway or two defenders. Another thing i’ve noticed is that they always close their feet just in time when i try to stickhandle through their legs. Any advice is greatly appreciated. Thanks! Once you get into higher level hockey the players will play the body a lot more. This is when the fakes will help a lot. The players watch your body so they can stop you, that is why you need to practice should fakes, head fakes, hand fakes etc. This will help you get around the players even when they are trying to play you. If they are playing the puck, deke them with the puck, if they are playing your body just push the puck past them and deke them with your body.